Gaura Purnima 2014 - A Golden Weekend ~ The Toronto Hare Krishna Temple! 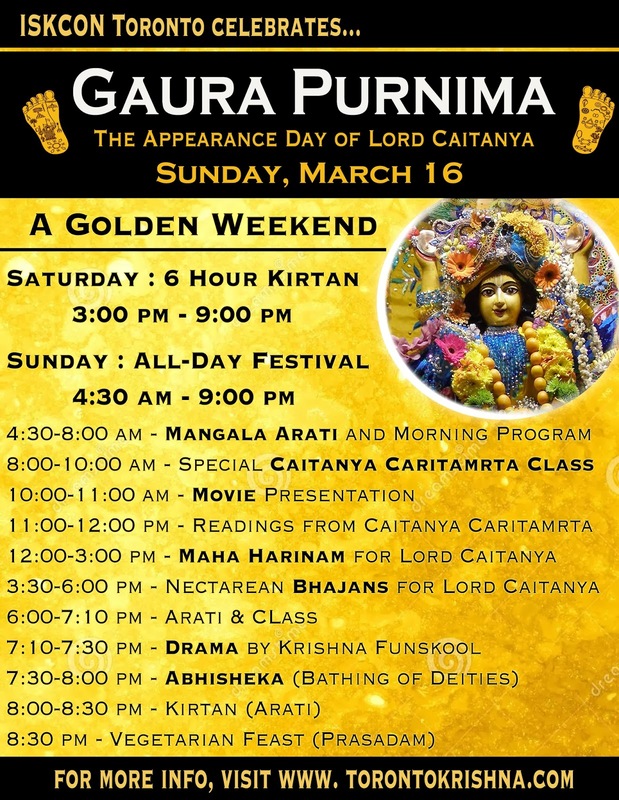 The Toronto Hare Krishna Centre would like to warmly invite you to join us for grand Gaura Purnima Celebrations this Saturday and Sunday, March 15-16, 2014! Gaura Purnima, one of the largest festivals at Toronto's Hare Krishna temple, is the celebration of the appearance of Lord Caitanya Mahaprabhu, who is none other than Lord Krishna Himself. Over 500 years ago, in a special appearance, Lord Krishna personally came as Sri Caitanya Mahaprabhu and acted as His own devotee by propagating the chanting of the Holy names of the Lord in every town and village! This coming weekend, the Hare Krishna temple will be celebrating the Appearance of Lord Caitanya Mahaprabhu with great pomp and grandeur! To start off the grand festivities, the Hare Krishna temple is pleased to welcome you all for our 6-Hour Kirtan on Saturday, March 15, 2014 from 3:00 pm - 9:00 pm. Having the festival fall on a Sunday means that we can have especially extravagant festivities and so devotees are encouraged to come throughout the day for festivities. Spiritualists are encouraged to come early in the morning (4:30am!) to take part in the morning program. A warm invitation goes out to you and your family for this larger-than-life festival as we celebrate the auspicious advent of the appearance of Lord Caitanya! Will there be a schedule for the 6 hour kirtan? Thank you Prabhu for adding some more details to the program schedule. I appreciate the gesture and your humility. It just make the whole festival more personal and spiritual. Please note that Lord Sri Chaitanya Mahaprabhu is actually Sri Krishna, who is the origin of everything; The Supreme Personality of Godhead. he came about 500 years ago in the service mood of Srimati Radharani to show the whole world how to be a devotee of Sri Krishna by constantly chanting the Hare Krishna maha-mantra. Haribol!